This new project is based on that archi-known japanese green overdrive. It is different in the component values (as many clones over there) and in the absence of tone control. 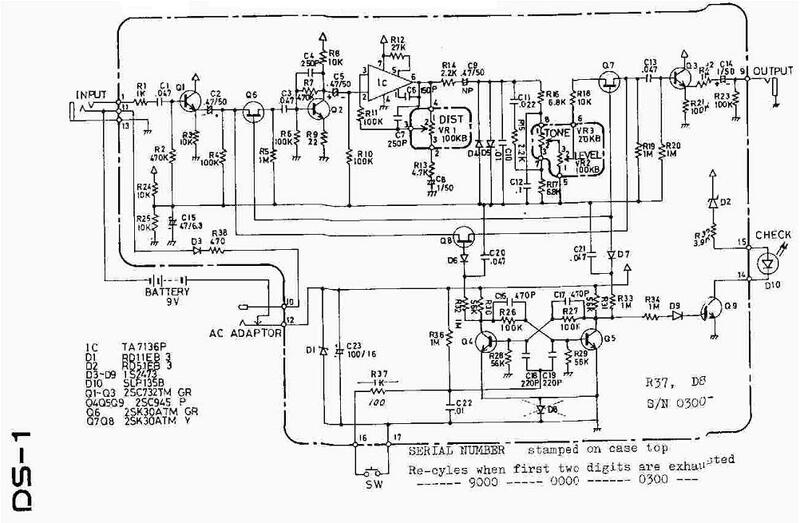 It all began as a simple overdrive circuit to be hidden inside a stratocaster, and it lived like that for a couple of days. For that purpose I didn’t need a tone control, because the guitar has its own one, and the amount of distortion was controlled by one of the strat pots (the middle one), while the other tone pot was controlling the tone of all pickups and also of the overdrive circuit. After trying the concept, I didn’t like the idea and removed the artifact from the guitar. But I liked the tone and tested it as an independent effect, even without the tone stage. Also, it would fit inside a 1590A enclosure, hence being a very practical device as a backup for my regular overdrive pedal or to be carried to jams or occasional gigs. I can live without tone control, because almost all electric guitars has at least one tone control, I have an equalizer pedal and all amplifiers have a tone stack. 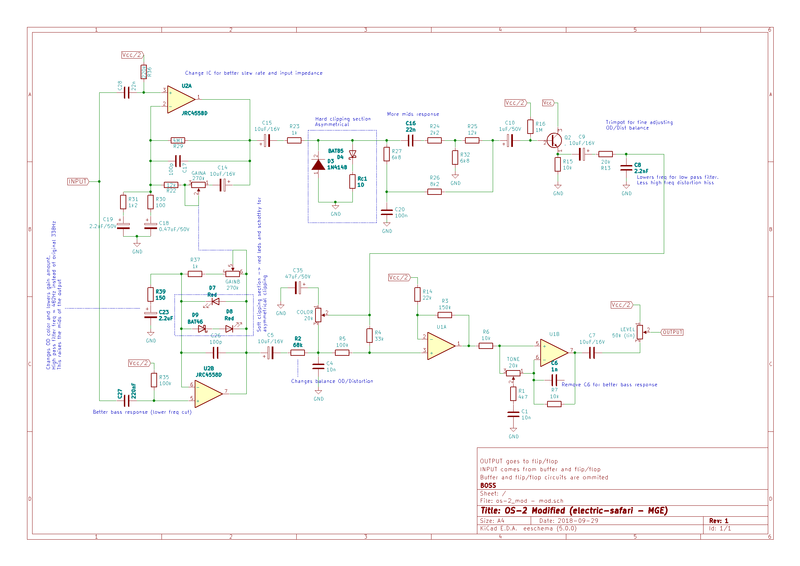 I have adjusted the tone in the circuit to my preferences, but some components can be changed to shape the tone. On the other hand, the tone stack can be missed if you have other effects after this one that can be affected by its tone (stacking overdrives, phasers, etc). 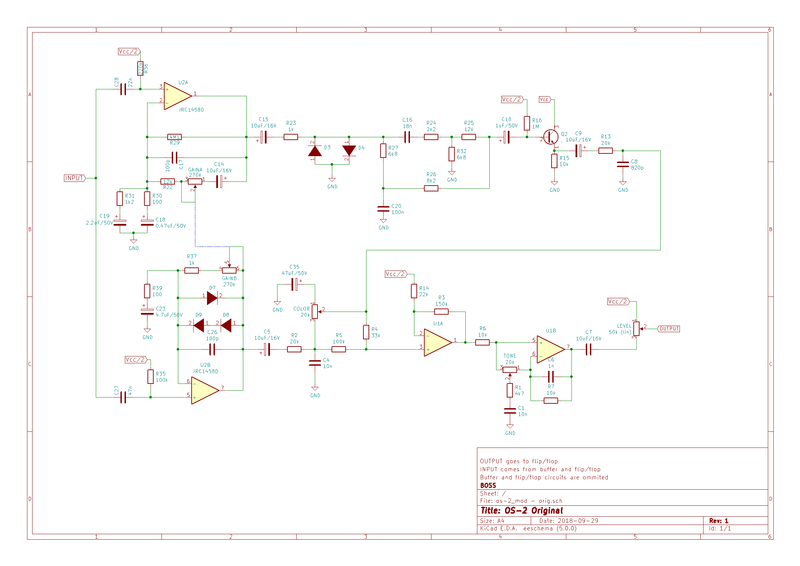 Of course, feel free to use the concept and the schematics if you like it. 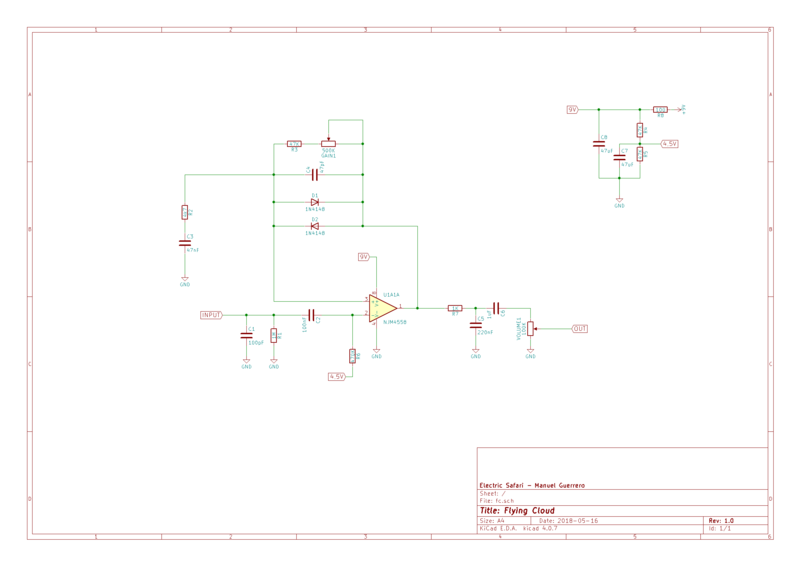 If someone needs the veroboard layout I can prepare it and publish it also. Just buy me a beer and we’re even 🙂 I’m planning to record a demo for this pedal in the following days. And why the name? The Flying Cloud was a fast clipper that sailed the seas in the XIX century. I like ships and this pedal is also a fast clipper (a soft clipper, to be more exact). PD: the 220nF capacitor at the output of the operational amplifier can be removed for a less muddy sound. It is included in the original green overdrive and I had to included it at first in order to avoid oscillation with an LM348 as operational amplifier. 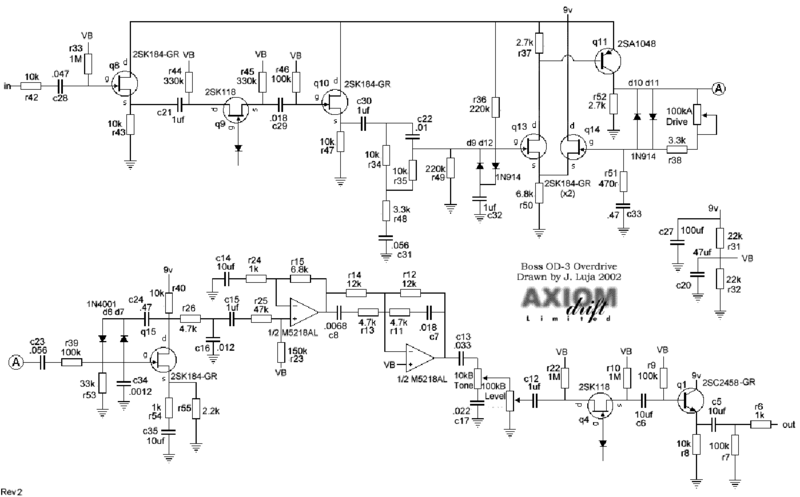 After switching to 4558 kind of IC, the oscillation is not present even in abcense of that capacitor. LM358 has a slew rate of 0.3V/uS, while JCR4558 has a slew rate of 1V/uS, which I think is the cause of that difference. In order to save space, two rows have been omitted from the layout, so it is 19×9 instead of 19×11. There are two rows with no components, they can be saved by using small resistors and ceramic capacitors. I have put the octave after wah and compressor and before overdrive, not sure if that is the right place, let’s give it a chance.